University of Otago palaeontologists are rewriting the history of New Zealand's ancient whales by describing a previously unknown genus of baleen whale, alive more than 27.5 million years ago and found in the Hakataramea Valley. The new genus and species of extinct baleen whale is based on a skull and associated bones unearthed from the Kokoamu Greensand, a noted fossil-bearing rock unit in the South Canterbury and Waitaki district from the Oligocene period, which extends from about 33.9 million to 23 million years ago. At this time, New Zealand was an archipelago surrounded by shallow, richly productive seas. Former Ph.D. student in the University of Otago's Department of Geology, Cheng-Hsiu Tsai and his supervisor, Professor Ewan Fordyce, have named the new genus Toipahautea waitaki, which translates in Māori as a baleen-origin whale from the Waitaki region. Professor Fordyce says the discovery is significant in New Zealand's fossil history. "This is a pretty old whale that goes almost half-way back to the age of the dinosaurs. We are tracking whale history back through time," Professor Fordyce explains. Baleen whales are a group of Mysticeti, large whales usually from colder waters that lack teeth but have baleen plates in the upper jaw which are used to filter food such as krill out of large quantities of seawater. 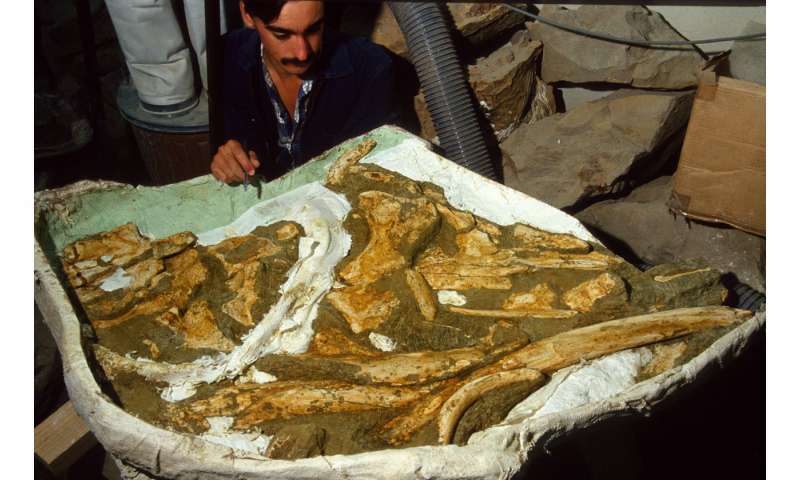 The fossil was actually recovered from the Hakataramea Valley in South Canterbury 30 years ago in January 1988. However, it was only worked up in recent years with Dr. Tsai—who is now currently working at the National Taiwan University—beginning his thesis only a few years ago. The thesis provided the analytical framework to identify and name the new whale. The research paper announcing the new archaic baleen whale was published today in the scientific journal, Royal Society Open Science. 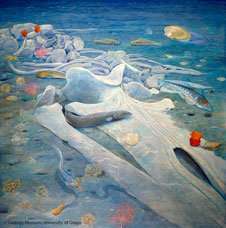 While the skeleton of the whale was disarticulated when it was excavated, the bones were closely associated, which gave the palaeontologists plenty of material to work with. In particular, the highly diagnostic earbones were preserved, helping with identification. The skull was about one metre long and the body about five metres, which means it was a reasonably small species, Professor Fordyce says. "That's about half the size of an adult minke whale." It was previously known that the baleen whales can take on board thousands of litres of water in the lower jaws which they scoop open to get great mouthfuls of water and food. Toipahautea waitaki's jaws were toothless, long and narrow, Professor Fordyce says, suggesting that it fed in a similar way to the modern-day minke whales. The researchers were not able to determine how this whale died. Professor Fordyce says it could have been attacked by a shark, stranded on a beach or died of disease. When it died, it sank to the bottom of the sea floor with its skeleton falling apart and becoming a hub for coral and other organisms to grow on. Professor Fordyce expects the ancient whales' history books may keep being rewritten in years to come. "We are pretty sure there are some species [of baleen whale] that will be older than these. But right now it anchors the modern baleen whale lineage to at least 27.5 million years." The Toipahautea waitaki fossil was collected during fieldwork funded by a grant from the National Geographic Society with further lab work also funded by the Society.